Recently, we had the pleasure of designing and building a sleek, modern, “long-scroll” style site for Technology Resource Group (TRG) based in Troy, MI. We were contracted by TRG to not only design and build them a new site, but to give their overall brand a refresh, complete with a new logo and updated color palette. The team over at TRG let us push the boundaries of design, style, and functionality. This allowed us to build for them; a user-friendly, easy to digest, and visually pleasing web experience. 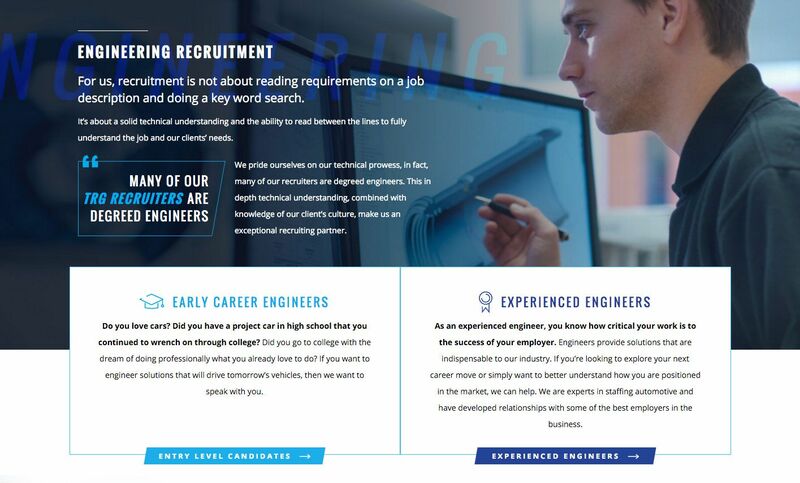 The goal of the design and functionality was to confirm to the end-user that TRG is a leader in their highly competitive field of Technical Recruiting and Project-Based Software Consulting. We added animation throughout the long-scroll to keep the user’s interest piqued as they digest the information displayed in front of them. The Services drop-down menu (and the Hero Slider) utilize a smooth transitioning anchor link that jumps the user down the page to whatever specific information they are looking for. This site is also 100% responsive - it adapts to fit all screens - mobile, tablet, or traditional laptop/desktop browser. 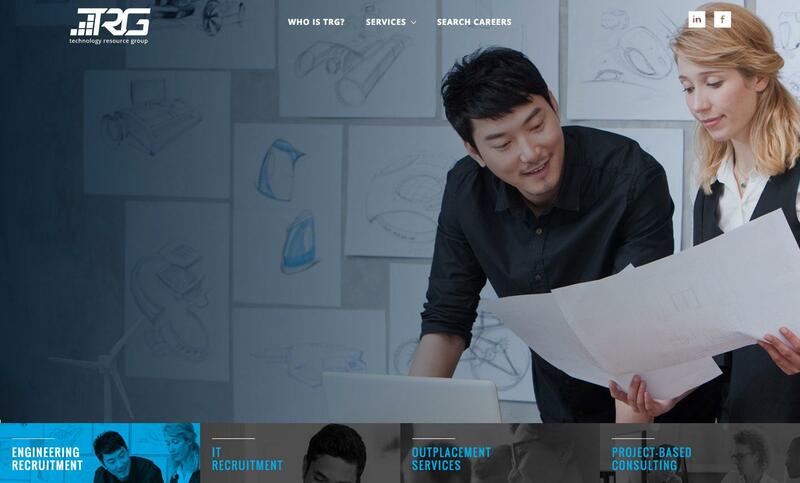 Technology Resource Group (TRG) is a full-service talent management consultancy focused on automotive and engineering recruitment and staffing, outplacement services, and project-based software consulting. Formed in 1998, TRG is based out of Troy, MI a suburb of Detroit.